As a recent college graduate, one topic that has fully engaged my attention lately is lifestyle inflation. I recently accepted a job where I am making quite a bit more money than I ever have and it has been a real challenge to keep my expenses down. For those not familiar with the term “lifestyle inflation”, it simply means that human beings have a tendency to increase their expenses when their income increases. I’m sure everyone has been there, whether it is buying a new house like I did, or eating out more often. I actually think that some sort of lifestyle inflation is to be expected and deserved when climbing the income ladder; the key is in making sure it doesn’t keep pace with your income growth. To me, this simple equation is pretty enlightening. It goes to show that no matter how much you grow your income, it can never make up more the 50% of the contribution to your wealth. To put it another way, the lower your expenses the more money you will have to save. Pretty simple right? Now that we have established that income is good and expenses are bad, let’s talk about some ways that lifestyle inflation can be avoided. My favorite strategy for avoiding lifestyle inflation is to increase your 401k contribution. If you are getting a raise, it is pretty easy to implement this on the same day you get your raise. Say, for example, that you get a 3% raise. If you elect to have that 3% go directly into your 401k, you will never suffer any lifestyle inflation at all because you won’t ever “see” that money come to you on your check. This plan wins in my book for two reasons; one: it is automatic and you don’t ever touch the money, two: you get to boost your retirement savings! Admittedly this plan does not work as smoothly when you start a new job, but it still works. When you start a new job you may not have immediate access to a 401k. At my current job I have to wait until I have been with the company for six months before I can enroll in my 401k benefits. The disadvantage here is that you may get used to having all of that extra money and it could be harder to roll it in to your 401k when you are eligible. The key is to consider your increase in salary as temporary and try to keep that mindset until you can start the 401k contributions. The automatic transfer strategy is very similar to the 401k strategy, except everyone can do it. Nowadays, most employers allow their employees to specify multiple accounts for their paycheck to go into. Usually you can specify a dollar amount, or chose a percentage of your pay to be deposited into a separate account each pay period. If that is not an option for you, most banks allow you to set up automatic transfer between accounts, so that is always an option. If you don’t qualify for either of these options you can always manually transfer the money yourself! The concept with automatic transfers is the same as it is with 401ks, if you don’t “see” the money, you won’t spend the money. If you are anything like me, having to make an additional transfer to spend your money will be a huge deterrent! If you can’t put your money into a 401k, automatic transfers are the easiest way to avoid lifestyle inflation. I like to call this strategy “lifestyle deflation” since it is pretty much the opposite of lifestyle inflation. Is there really a better way to control your spending than to spend your excess money on debt? This strategy pretty much kills two birds with one stone and will leave you feeling great when you are finished. Seriously, there is no better feeling in the world than being debt free. If you throw every extra penny you make towards debt payoff you will be amazed at how quickly your debt will melt away. If you are a rock star and have already completed all three of the steps above there are still other options to help you avoid lifestyle inflation. I consider investing in any assets that appreciate (stocks, real estate), or investing in yourself (college, community courses) to be great ways to avoid overspending. Sure, you have to spend a little bit to make them happen, but the returns outweigh that expense. I am also a big advocate of giving to those in need if you can. Not only will it be extremely helpful to those that receive the gift, it is also good karma! Avoiding lifestyle inflation is an important part of becoming wealthy. What have you done to help you keep your costs under control? Do you think I’m crazy and want to spend all of your money as soon as you get it? Let me know in the comments below. Author Bio: Nick graduated with a degree in Information Systems in December 2012. He spent the bulk of his last semester in college focusing more on transitioning to the workforce than my classes. Making the transition into the workforce was something that he doesn’t feel school prepared him for, so he blogs about the lessons he is learning. But I WANT lifestyle inflation! I’ve lived a miserable 15 years of personal financial austerity due to the starving-artist nature of my income. It’s time (for me) to enjoy life more. We’ve done a lot of the same things to help avoid lifestyle inflation. For us we have learned that by allocating ourselves some “fun” money each month we can help curb that felt need to just spend more. We do it within reason and maximize it which helps making the saving/investing easier to attack. Great point John! If you budget in some “fun” money you can keep your lifestyle inflation in check and still have some fun. Thanks for pointing that out! I agree that the temptation is to increase your standard of living when new money comes in. I also agree that is makes more sense to use that new found money to improve your wealth position rather than your luxuries. I think this is one of the biggest factors that prevents people from or enables people to build wealth. It is all about mindset! If you can develop a “pay yourself first” mindset, there will be room to increase wealth and have some fun! J, love the way that the site looks right now! And we are trying to avoid lifestyle inflation. Yes, we have added some expenses, but we were not doing well with income before, whereas now we are. We need to put spending to a halt now though! One of the really dangerous parts about lifestyle inflation is how quickly it can get out of control. If you are earning more money you deserve to treat yourself a little bit. The key is to do it in a controlled way! I’m actually looking forward to just a little lifestyle inflation if either my freelance income improves or I get a full time job and have a better salary. I really need clothes. lol! But yes I do know what you mean. My hope would be living within my similar (very restrictive) budget for awhile to cover what I haven’t been able to contribute toward retirement. Depending on your need for clothes that might not be considered lifestyle inflation, haha. I think John’s tip above to budget in some fun money is a great idea for a way to keep your lifestyle inflation in check. Since I´m a student, BF has had to follow my level of spending, which has kept him from any lifestyle inflation. Which he has discovered is great, because it enables him to save half his paycheck each month! That is really good, I wish I could save half of my paycheck every month! These articles are so useful for young individuals because lifestyle inflation can be such a big deal to someone who just got their first post-college paying job. You pointed out the major ways to help make sure you are on the right track to financial success. Huge fan of automatic transfers–enforced habits are the habits best kept, I’ve found. Have you read the book “The Millionaire Next Door”? That book has a lot of wonderful advice for automating your finances! 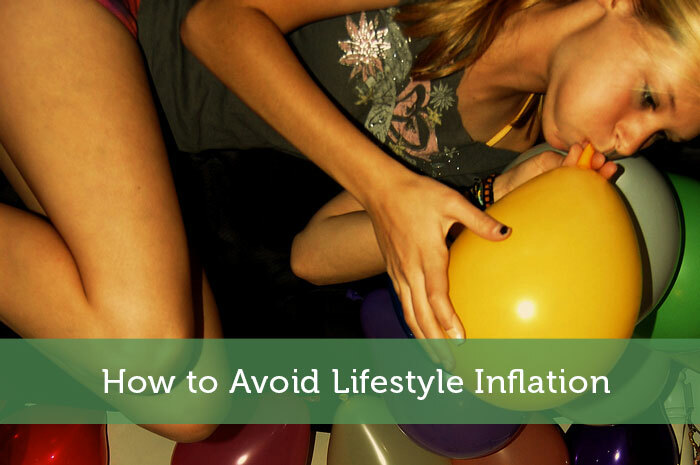 Great tips on avoiding lifestyle inflation! It’s nice to include a little more fun in your life once you have the money, but definitely yes try to trick yourself into saving more. Great advice! I’ve found that budgeting for frivolous spend , actually carving a set amount out to waste, helps me stay within my means and still have a good time. One way I’m dealing with lifestyle inflation is with earning extra income from my blog. I know it’s great to earn this extra money but I’ve learned over time it’s definitely something you don’t want to depend on all the time. Instead I focus on keeping a great budget, and living within my means with my current work income and any money I do happen to earn from my blog goes directly into savings. Oh and by the way I love the new site look Jeremy. It sounds like you have a great plan! I avoid it by hiding my money in different accounts. I utilize automatic transfers and that keeps the money out of site and out of mind. This method works really well for me. That is a good idea too! Personal Finance is always about doing what works for you. Well written, Nick. Thank you for the reminder about automatic transfers. I’ve thought about doing this in the past but had forgotten about this strategy. I really need to put this into action as we try to save for a new house in the near future. It can be avoided, but it takes a great deal of self control. Once i realized how much money i was spending on things that would have been considered unnecessary or not affordable prior to those increases, i made changes to my budget, and have managed to save more money. It’s great to have nicer things when you make more money, but there has to be a clear understanding of what is just irresponsible spending. Well said Martin. I use Mint.com to track all of my expenses and makes it pretty easy to see when I am spending money on dumb things. I identified a huge fast food expense every month and that prompted me to start bringing lunches to work. It didn’t really improve my life to be eating out every day and it has saved me a ton of money just by planning ahead. I think that is an acceptable case of lifestyle inflation!